It’s pretty hard to get excited about a USB cable, but the Dexim Visible Smart chargers are ridiculously cool in a super geeky way. 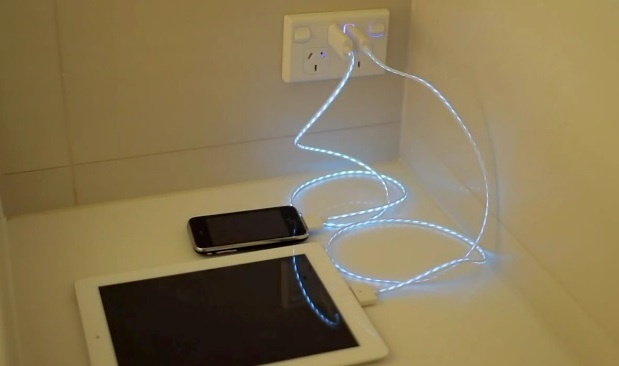 You need to watch the video below to see the effect, but basically the cable glows while it is charging or syncing to “visibly show the electrical current flowing through the cable.” The lights actually change speed based on the battery capacity of the iPhone, iPod, or iPad, with the animated lights moving quicker the lower the battery charge is, and finally stopping motion once the battery is charged. You can buy the glowing Dexim charger on Amazon for about $30 . Coolest USB cable ever? Yea, I think so. Heads up to Gizmodo for the find. how come the iDevices don’t light up when plugged in? Apple should add some visual cue to their iOS devices’ chargers. This is too flashy, but something like the LED light on the magsafe adapter would be nice. I’m wondering if my cat would leave it alone…? Wow, that cable is sheer ugliness. I’m more interested in the ac wall outlet with interrupters and usb charging ports shown on your picture. I’m looking for that. What brand is it and where did you purchase it? Are the interrupters for the USB or the AC outlet or both? Just looked at the picture again looks like a European AC outlet. I absolutely love the effect created by the LED light.